Paradise Later is a documentary adaptation of the Joseph Conrad novel "Heart of Darkness." 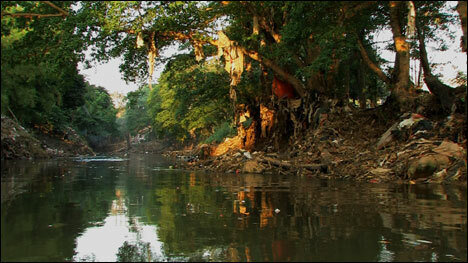 Inside the head of a trader, we travel on a river that meanders through apocalyptic scenery. Blinking. As if eyes had to adjust to the light, the images appear in the glaring white and then disappea – withdrawing from our curious, greedy gaze. While a traveling salesman reports to his company´s managing board off camera and the man´s doubts and complaints become more obvious, the camera follows the course of a lazy river on the edge of a large tropical city. "The conquest of the earth is not a pretty thing when you look into it too much." 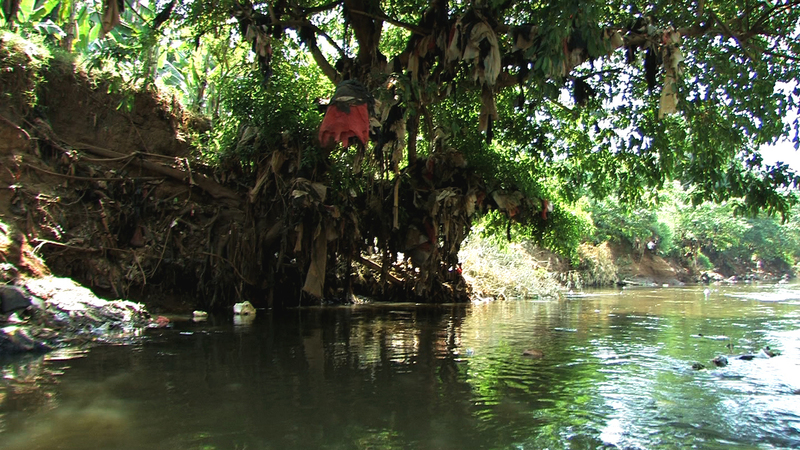 The riverbanks are covered with piles of garbage where goats graze, trash hangs from the trees like tinsel, and fast-food wrappers float on the water´s surface. Fishermen cast out their nets like clockwork in the hope of catching something they can eat or use, and children play in the muddy water in front of rundown shacks. The atmosphere, made unreal by the soundtrack, is occasionally punctuated, as if the surroundings´ "real" sounds and voices were trying to hold their own against the omnipotent voice. Of all the world´s emerging markets, Indonesia, with a population in the millions, represents the best opportunity for unbridled international capitalism. In the global competition for new factory locations and markets, colonialistic corporations are ignoring social and ecological standards. The outer and intermediate zones of exploding, Moloch-like megacities are home to more and more people living in profound poverty, who subsist on the refuse of an expanding consumer society. The documentary images captured by cameraman Victor Jaschke are not consistent with the familiar advertisements featuring palm-lined beaches. The text used for the narration is a distillation of Josef Conrad´s 1899 Heart of Darkness, which Breuer transposes from late 19th century Belgian Congo to 21st century Indonesia. Conrad´s novel is relevant, both as political commentary and also because of its monolithically logocentric air, which seems to arrogantly place itself above the images of poverty and suffering. Paradise Later develops a disturbing draw that, through the juxtaposition of the literary text and the unhurried, deliberate images of misery, produces an unconventional and ambivalent critique of globalization: Apocalypse now – paradise later!